Saraveza’s will be hosting a Cantillon Flight Night on Sunday, November 2nd from 4 to 6 in the Bad Habit Room. Saraveza’s Vintage Program for a very special sampling of beers from the world famous Cantillon Brewery in Belgium. The host for the evening will be Saraveza's resident vintage beer expert, Tyler Treadwell. To get a flight for this special event will cost you $30 for all five beers, plus a sampling of handmade snacks. Tickets are very limited and only available for purchase on their website. 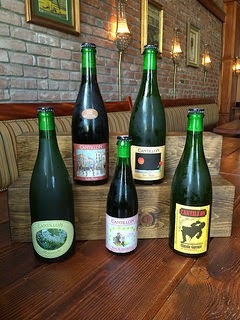 Cantillon is hard to find alone, but a flight with all of these beers together, is not something to be missed. A list of beers that will be included in the flight, along with vintages and beer advocate listings is listed below. This should be a very sought after flight so grab tickets before they sell out, because they will.